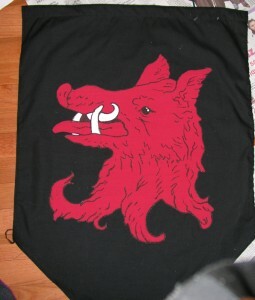 Hi I really like those Medieval Banners you made and planned on making similar style ones for my wedding. I was curious how you went about making them and what fabric and paint you used. Any help would be greatly appreciated. Thanks! Hey Lauren! 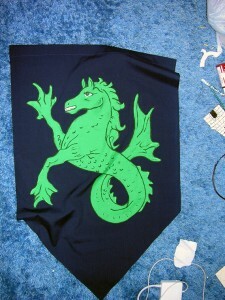 My banners (including the charges) were made out of broadcloth. Broadcloth is nice and cheap (perfect for when I had no money 7 years ago!) but you could always upgrade your banners and make them out of linen or velvet, and choose a non-fraying fabric for the charge (like a woolfelt). I used Weldbond white glue to glue on my charges, then outlined them with regular acrylic paint (this also prevented them from fraying). 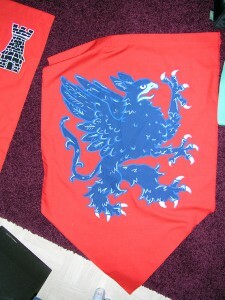 The banners were two rectangles stitched along the sides and top. About two inches were left open from the top along either side. This was turned inside-out, the bottom was serged shut, and the 2 inch opening at the top was left open (the edges were finished, and a line was stitched acrossthe banner just below the opening ). The charges were added and a dowel was run through the top opening. I actually think they were constructed a bit differently, but that’s how they were done more or less …plus if I had more time (and knowing what I know now), I would have done a bunch of stuff differently – used different fabrics, hand-stitched on charges instead of gluing them, hand-stitched-closed the bottom of the banners instead of serging them, etcetc. Hope this helps!